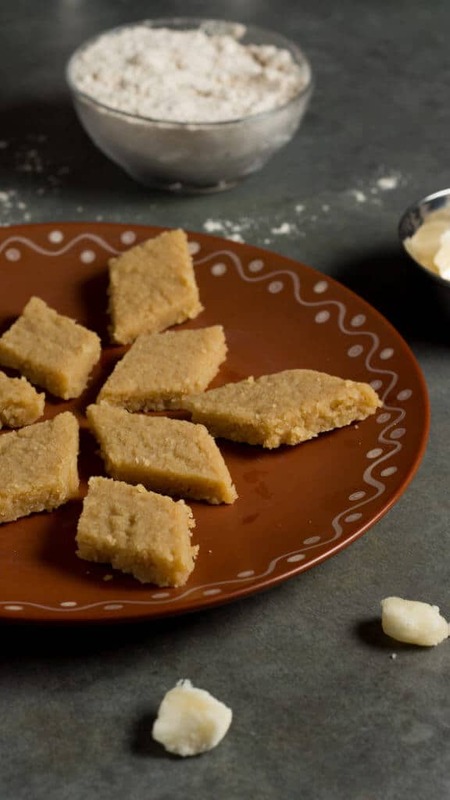 Sukhdi is an Indian dessert/Mithai made from wheat flour and jaggery in clarified butter. 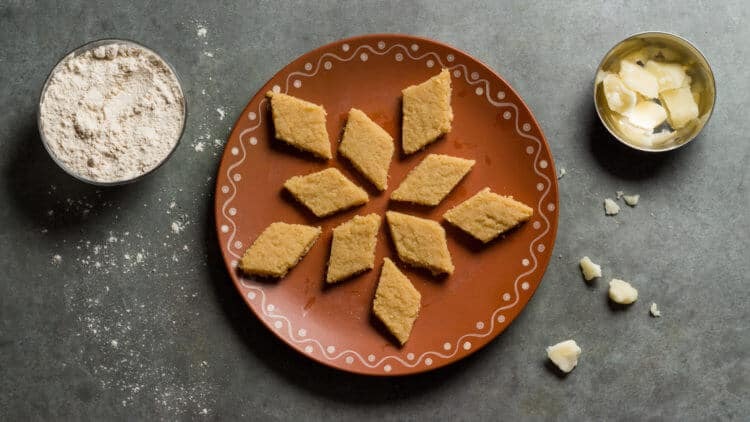 Sukhdi is a staple bite like biscuits prepared in most of the Gujarati homes. It is also made on auspicious days or on festivities. Also known as Gur papdi, it has melt- in –the- mouth texture and the mild sweetness comes from jaggery. Enjoy this traditional wintery Mithai which takes just a few minutes to be cooked. Next time you have sweet tooth craving try this instantaneous Mithai. The next time you have a pooja at your home, don’t buy market sweets try various homemade recipes like milk powder ladoos or Kalakand to make the moments more authentic and pure. On a medium heat, add flour to the ghee and mix it well so there are no lumps left. Meanwhile, grease a plate with ghee to take the mixture out on it. When the flour has roasted well, changed its color and lets off a nice fragrance, at this stage add jaggery. Mix well so that the jaggery blends in well with the flour. Keep it on a medium flame. When the ghee starts to separate from the mixture, switch off the flame. Take the mixture out on the plate greased with ghee. Even it out in the plate and tap the surface to make it plain and smooth. Cut into the shape of your choice and let it set under a fan. Serve it to your family and friends if you enjoyed the recipe and do not forget to mention in the comments.